The Ambassador-Designate of Uganda to the Republic of Maldives, Her Excellency Ms. Grace Akello, presented her credentials to President Ibrahim Mohamed Solih at a ceremony held this morning at the President’s Office. Meeting the Ambassador after the ceremony, the President congratulated Her Excellency on her ambassadorial appointment and conveyed his best regards to the President of Uganda, Yoseri Museveni. During the call, the President and the new Ambassador discussed ways to further enhance existing bilateral relations between Maldives and Uganda, emphasizing opportunities to enhance tourism collaboration, air connectivity and trade. Ambassador Akello expressed her heartfelt gratitude for the warm and traditional welcome she received when she visited the Maldives and stated that it is a privilege to serve as the Ambassador of Uganda to the Maldives. 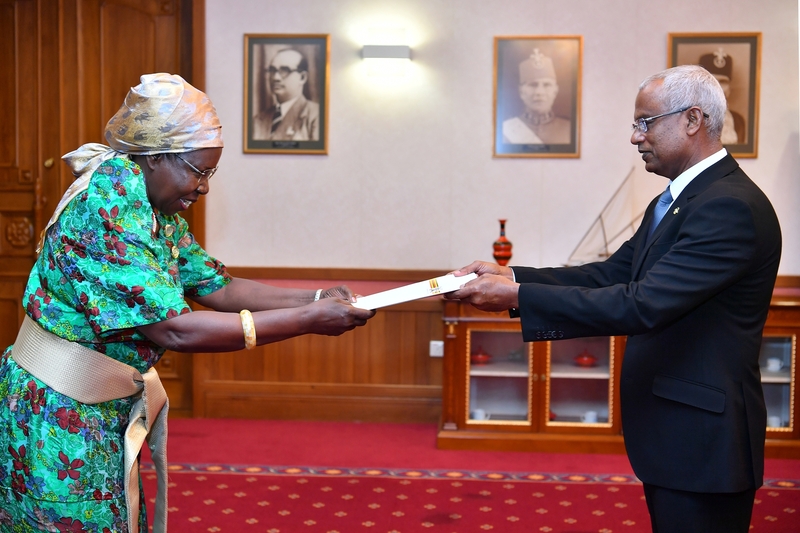 She further expressed that she will remain committed to ensuring that the positive trajectory of relations between Maldives and Uganda will remain intact during her tenure.